The L.L.Bean flagship retail store in Freeport, Maine, located near the outdoor retailer's corporate offices. Improvements in core profitability enabled the company to invest nearly $45 million in employee benefits in 2018. L.L.Bean announced today both its fiscal 2018 sales results and its intention to pay a performance bonus to its employees. 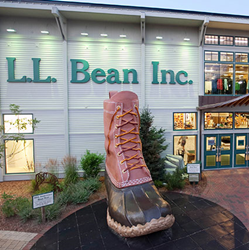 For the fiscal year ending February 24, 2019, L.L.Bean reported annual net revenue of $1.6 billion, up 1% over 2017. Based on these results, the L.L.Bean Board of Directors approved a performance bonus of 5% of annual pay to approximately 5,400 eligible employees, as well as an additional 2% enhancement 401(k) contribution. The solid company performance comes at a time when the retail industry continues to experience challenges and follows a year in which considerable changes were made at the company. In 2018 the company completed the upgrade of internal legacy technology and warehouse systems which resulted in record setting daily orders processed, the highest on-time delivery and the lowest customer product backlogs in decades. Additionally, changes to the return policy cut fraudulent and abusive returns. L.L.Bean also continued to grow its Be an Outsider marketing campaign that has attracted a notable increase in new buyers. The company made significant investments in employee benefits. Improvements in core profitability enabled the company to invest nearly $45 million in employee benefits in 2018 including the discretionary cash bonus, 401(k) contributions and enhancements, expanded paid time off, paid parental leave and eldercare support, and a holiday gift.